A lot of Bloggers who setup their own Custom Domain often run into trouble by not setting up their DNS settings correctly. You need to make sure you have the following settings EXACTLY as shown below. Either do this yourself in your DNS control panel of the company where your Domain is registered or contact their support and ask them to do it for you. Once you have made the corrections, try your Custom Domain again by doing the following. 2) Then once saved go back to Settings, Basic and click the Add Custom Domain link, then click Advanced Settings link, and put your domain in www.yourdomain.com (lowercase) and save your changes. 3) On this screen make sure you click the Re-Direct check box. You should see on this page your ANAME and CNAME Records as defined above. Notice the 4 ANAME Records and the 1 CNAME Record. If you are still having problems, leave me a comment below with your Domain Name and I'll try to help. original domain is bhagwatilal.blogspot.com is redirect to www.designprefix.com. Hi @Bhagwati Your DNS is not setup. There are no CNAME or ANAME Records. Contact your Domain Register and ask them why it's not show. Yes, those setting ARE ALL CORRECT. The problem is that you Your Domain register has a problem. Those Settings are not getting pushed out to the servers around the world. There a NO Settings being displayed. Contact your Domain Support people and show them that link. Until your domain register fixes that there is nothing that anyone else can do. Once those are fixed your Domain will work properly. Also show them this link. It shows THEY have errors. You'll have to ask your register if you can switch easily. I use GoDaddy for all my Custom Domains. Excellent. It looks good. No it should be fine but you might ask them just in case. Thanks for this - I think I have done it correctly now but I am still getting a blank page - am I being to hasty? You will see that currently only the CNAME record is showing correctly. The 4 ANAME records have not yet come through. Hi I have a domain named www.abundance.com. I previously had purchased a domain www.fe-nation.com from blogger and Google, but wanted to change it to www.abundance.com. After changing, it stopped working, where can I add these DNS numbers? I have several domains that I have successfully redirected to blogger but I am having trouble with www.jeremygentles.com. I am receiving the "Another blog or Google Site is already using this address" error. Additionally, when I try to type my url in directly into the browser it then redirects to www.www.jeremygentles.com and then get forwarded to an error page. Jeremy Gentles I can't see anything obvious wrong with the DNS settings, they all look fine. They are a problem with their nameservers. That might be confusing blogger/google. You will need to contact Bluehost and ask them. Grr I did all this stuff and it made it worse now it says page not found!!! and my blog does not work at all anymore! I switched back to my blogspot url for now. But can you please help? @Nathan You DNS is NOT setup correctly as explained here. Look at your settings here. Contact your registar, ENOM and get them to make the changes for you if you are unable to do this yourself. I contacted them and asked for them to do it and they said "When Google registers a domain, it puts default Host Records and MX Records on the domain." They didn't say anything about helping me what do I do now? Your going to have to either do it yourself or keep contacting their support until you get someone who knows what they are doing. Hey i think it is fixed? Could you check my domain? www.encouragism.com I am trying to host my blog (think-speech.blogspot.com) and it has not been working. Your DNS Settings are all ok.
You'll just have to wait for Google to find and fix the problem. But it's still now working for me. Just happened yesterday. domain is http://www.JulieCamell.com and it still showing the 404 Page Not Found error today. I keep refreshing but nothing. Should I unpublish the domain again for now (to just have the blogspot domain again until the issue is resolved)? Hi i am having trouble with my blog as well, I bought a domain last week and the web hosting site has helped me with all the settings but my domain is not working, I cannot access to my blog for around 5 days and it's really annoyed me. My ori domain is www.lizzieleong.blogspot.com and redirects to www.lizzieleong.com, can u please check it for me? thank u so much! @disqus_EMcydwBkfj:disqus It looks like you're having the same problem as others. All you can do is wait for Google to fix the issue. Marie, I think you're just going to have to wait until Google fix the issue I'm afraid. Hi. I got the same problem. I don't have the possibility to redirect the domain adress in my advanced settings. Furthermore I have seen an update in google instructions for the CNAME settings. There is a second CNAME setting to be done as they say. See Information when changing the domain settings. But it is a crypted and very long CNAME setting which I can't even insert in the textbox at my domain settings. Any ideas or is this a bug following the previous one? @google-34b470912709195e04b5ce6029036b6d:disqus When did you purchase the Domain? Did you purchase it through Blogger/Google or direct with the domain register? I purchased it about 3 weeks ago from www.netfirms.com directly. Blogger was not part of that transaction. Sometimes it can get a little "stuck" especially if you entered your domain without being in all lowercase. 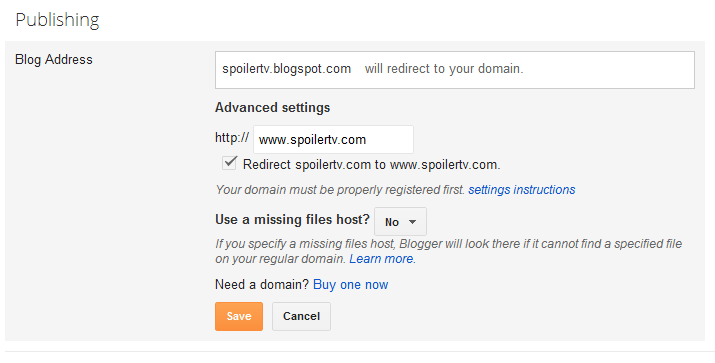 Ok, first go to Settings, Publishing and click the Switch To Blogspot link and save the changes. Then once saved go back to Settings, Publishing and click the Custom Domain link, then click Advanced Settings link, and put your domain in www.theworldlywisdoms.com (lowercase!) and save your changes. Then make sure you tick the Redirect Checkbox and Press Save again. If it does not work first time, try it 2-3 times to try and "unstick it"
the strange thing is that I don't have the Checkbox for redirecting in my advanced settings like I can see them at your screenshots. My standard language is German but I changed it to English, to see if anything would change. But unfortunately not. I try it a couple of times. Thanks for for extremely quick response anyhow. We have not been able to verify your authority to this domain. Error 32. Best bet is to post in the Google Support forum and hopefully one of the technicians will be able to take a look at it for you. Is there a way to write my custom domain in blogger without www? I could do that before latest update. I put a space before domain and it worked, but now i can't. Tell me if you could help me, please. After changing to custom domain, My blog is not opening. It is saying server not found. Can you please help me.